It was a big day for ground squirrels today, and abstract photos of boat reflections. Thank you to Sandy for joining me on this walk today. We parked by the Oyster Point Fishing Pier (see image)/Oyster Pt. Marina; and we walked north to Oyster Cove Marina and back. My friend Elise and I enjoyed the afternoon sun, but it got much cooler as soon as the sunlight started disappearing. We were approached by a very friendly dock cat at Oyster Point Marina (see image), and later we spotted a black-crowned night heron (see image) as well as several other birds. Elise's comment was that this night heron looked a bit like a penguin - or at least its closest relative in the Bay Area. Another beautiful day. I walked today with my friend Sandy, and we discovered, as we walked south from San Bruno Point parking lot -- expecting to hit a dead end, that the dotted line (gap) shown on the Bay Trail map (south of San Bruno Pt.) was now a walkable path/trail. So, we headed south (toward the San Francisco airport); occasionally peered down at clumps of shorebirds embedded in the short grass and mud/sand by the water; and enjoyed the sun. We stopped at a bridge not far from Belle Air Rd. and Airport Blvd., turned around and headed north back to San Bruno Point. My only heartbreak this evening: not bringing a camera with me, because I thought it would be too dark. As if to mock me, a gigantic, cheddar cheese pumpkin of a moon rose out of the Bay, casting beautiful reflections on the water. Silhouettes of planes landing at SFO started to cross in front of it. Never leave your camera behind. I also have to say, it is impressive watching thundering planes/jets take off in pairs so close-up. Although I wouldn't want to live this close to a major airport without extra soundproofing in all my walls. One final note: I was struck by how much more foot traffic there was in this segment this evening. Hurray, people walking, and taking advantage of this great resource we have at our disposal. None; I could hear a few shorebirds, but it was too dark to see any creatures - except a few dogs going walking with their owners. I finished walking the two loops that are part of the Burlingame segment of the Bay Trail. The smallest loop is the walk around Anza Lagoon which is ringed by hotels, restaurants and office buildings, but still remains quiet and peaceful given the ample buffer space around the lagoon. 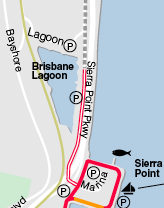 The (lower portion of the) larger loop is made up of Airport Boulevard which is linked at both ends to the Bay Trail that fronts the Bay. The weather was warm and beautiful. In the absence of wind, the water was very calm, and was bathed in pastel colors at sunset. I watched two fishermen whose cell phones kept ringing. Walking Time: 3 hrs., 43 min. (1:46 - 5:29 p.m.) less 1.5 hrs. for breaks. I passed The Sherman (apparently an old, permanently docked Oakland Ferry boat) first. It took me a long time to cover a little more than 3 miles, because I made two long stops: 1.) I paused to talk with a birder, NW of the Embassy Suites hotel, and that was quite a long, interesting conversation; and, 2.) I stopped to eat an early dinner at Max's Restaurant in Burlingame. The latter stop was also my turning around point. I took so many pictures of the moon rising on the way back that I worried the parking lot would be closed before I could pick up my car; but all was well. Run, run, picture, picture, run, run, picture, picture. I started to feel like a darting shorebird. 3 cormorants; 8 Western grebes; 8 little tiny brown jobs (LBJs); 5 brown pelicans; 29 sea gulls; 2 butterflies; 2 feral cats (see image at right for cat next to the spay neuter Peninsula Humane Society building); 2 crows; 9 Canada geese flying overhead; 15 ducks (darker in color than normal mallards, saw on and under water); 105 UBBs in shallow water or water's edge; 3 black-necked stilts (flying past, close to water); 2 snowy egrets; 3 willets; 1 plover; and 1 couch.